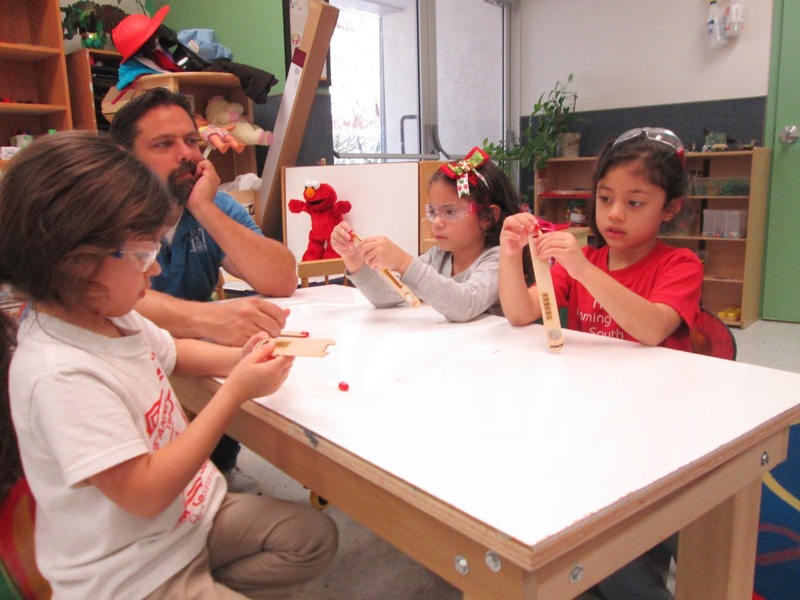 In the FabLab we had been exploring the use of craft sticks, a material that both the children and the teachers feel comfortable with as the base for many arts and crafts activities, as a base for circuits. Using our Epilog Laser cutter we designed a simple circuit template, that could be created by the children, and was open enough so that they could easily incorporate basic electronics into their crafts. 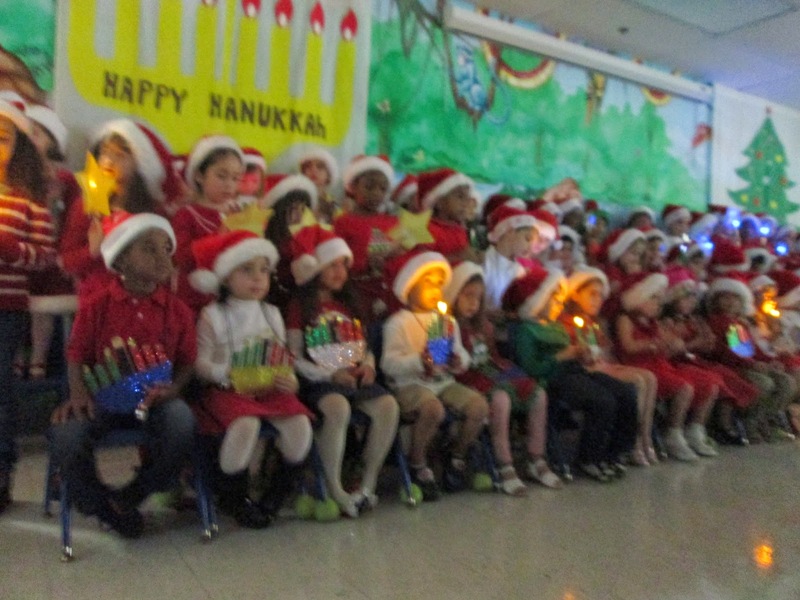 For the annual holiday show each teacher decided on a prop for the children in the class to wear. 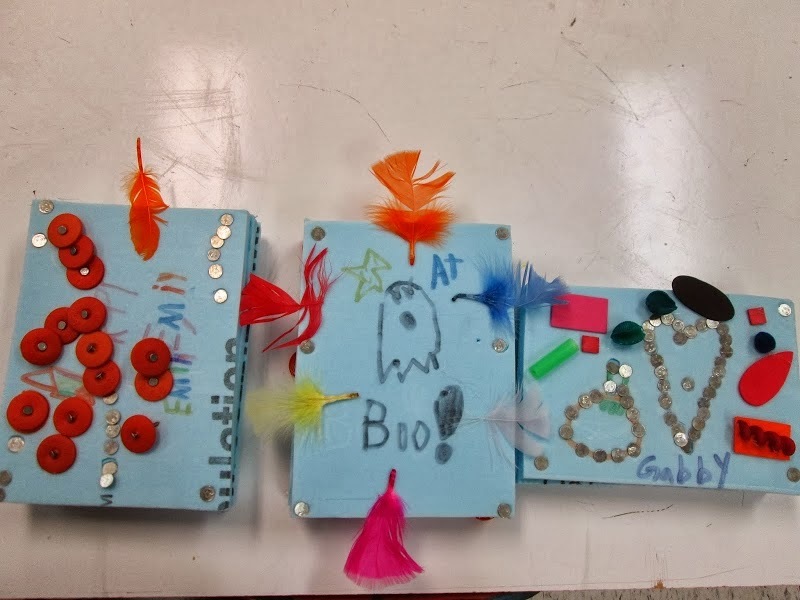 In an effort to provide a festive look, the children made a circuit with a specific LED light to represent their class. The light was placed behind the prop allowing only the switch to show. 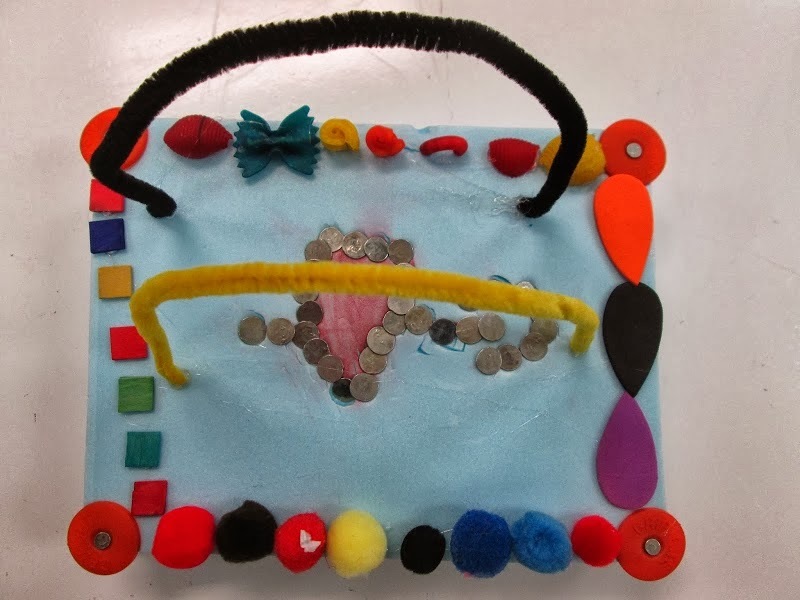 For this activity the classroom lead teacher and assistant joined the Play Make Share staff. Each teacher sat with a small group of 4-5 children. 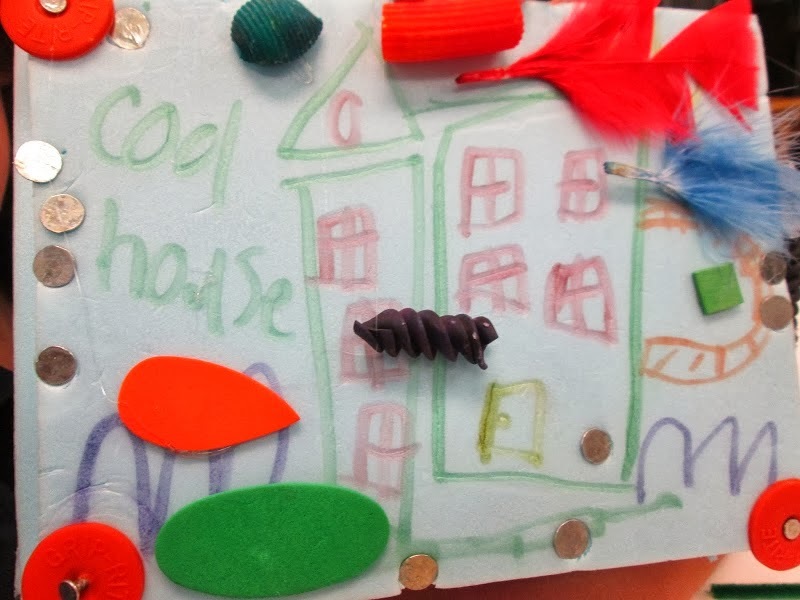 The children were previously introduced to a squishy circuit activity in August and were able to remember the names to the materials with an exception to the copper tape. Details as in the LED lights having a long leg/ short leg, battery having a positive side/ negative side were recalled by the children in every group. 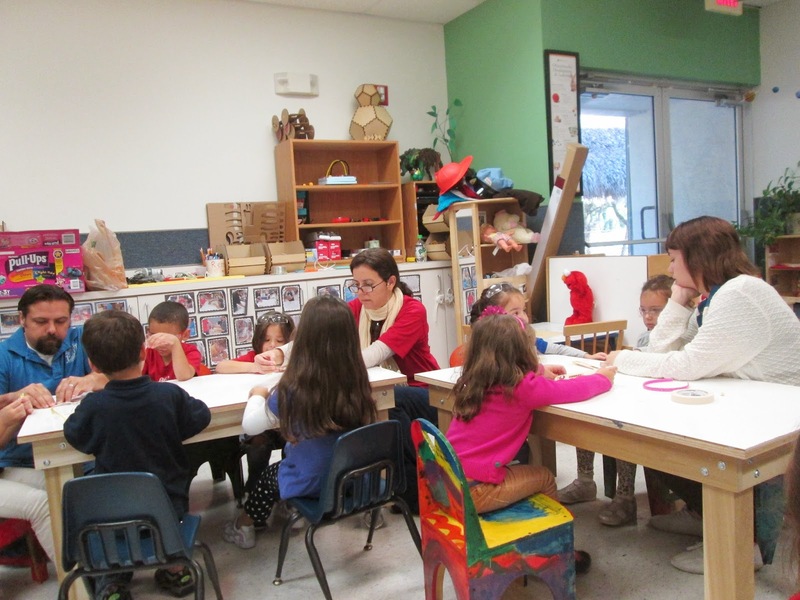 After discussing the materials and their purpose in a large group, the children’s attention was drawn to the teacher at their table. 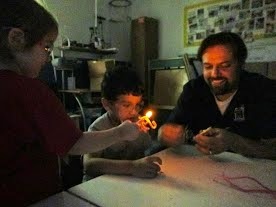 The children were encouraged to place the light and battery on the Popsicle stick. 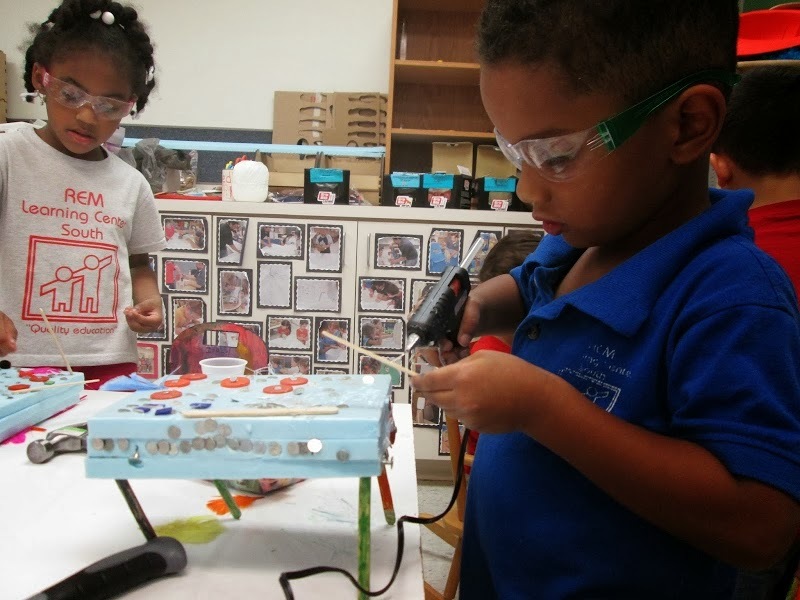 Once all of the children at the table had finished, the teacher would show the position of each item modeling and giving the children sufficient time to rearrange their light or battery. 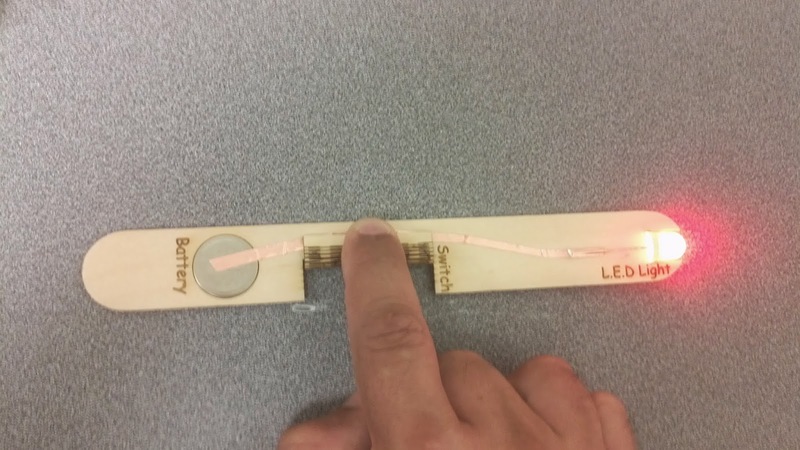 One of the challenges the children face is connecting the battery to the LED light on the popsicle stick without it constantly falling off. 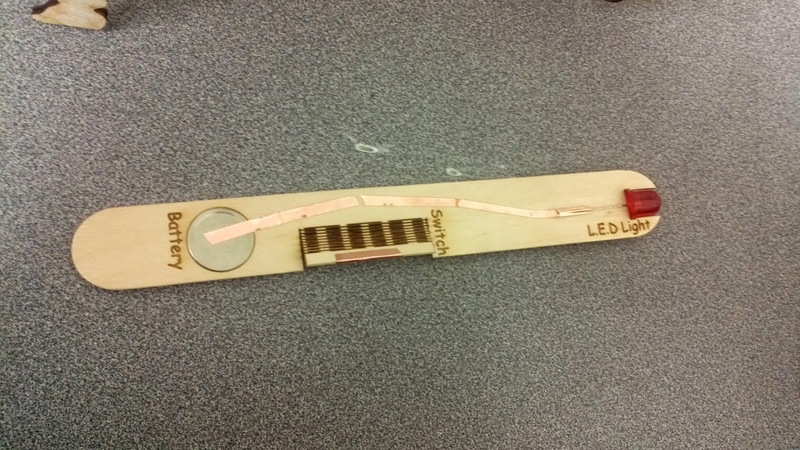 To ease this challenge and lower the barrier a little, we designed a popsicle stick template that allowed the battery and LED light to be press-fit, thus ensuring they would stay in place. The next step would be to connect the LED to the battery using copper tape. Separating the back of the copper tape and placing it correctly proved to be challenging for the children. It took quite a bit of patience on their part but they all managed to find assistance among each other. Once more the teachers at the table modeled where to place the copper tape. Finally the last step consisted of enjoying the lights turn on and off. 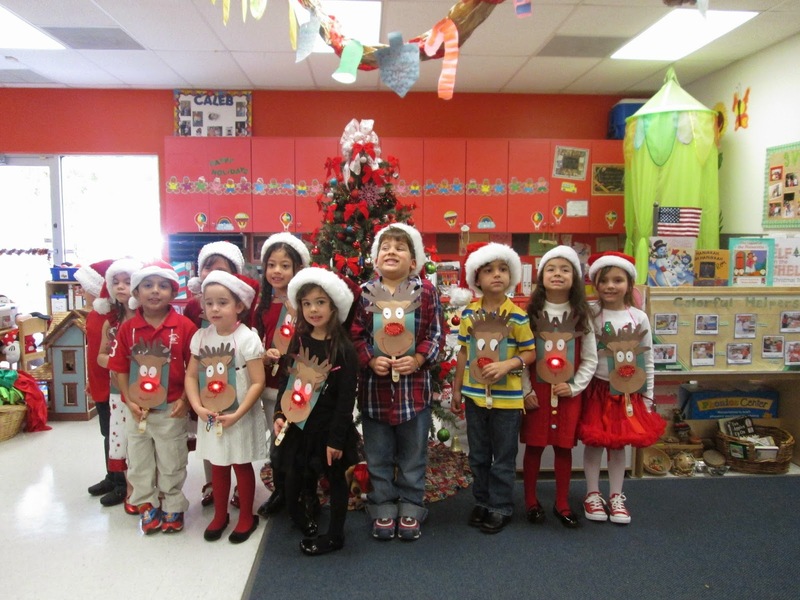 The holiday circuits were placed behind the props in their own classroom. 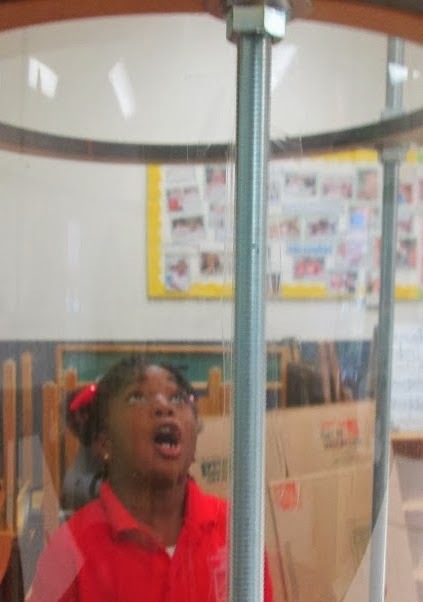 The wind tubes are the most fascinating items in the classroom for the children. 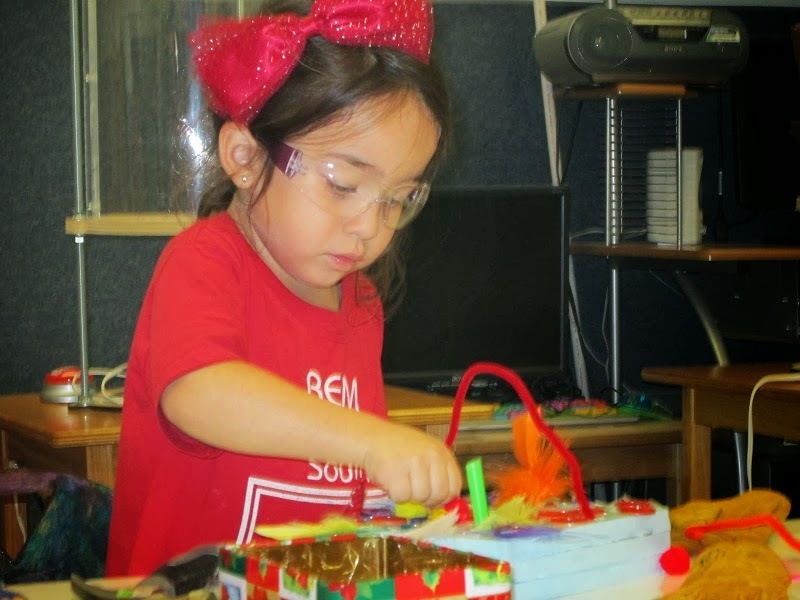 They have had endless opportunities to explore with them, yet find themselves driven to them every time they enter the classroom. Taking their eagerness into consideration this activity was right up their alley. On the first day two pieces of tape were placed within a designated area of the clear plastic which forms the tube. 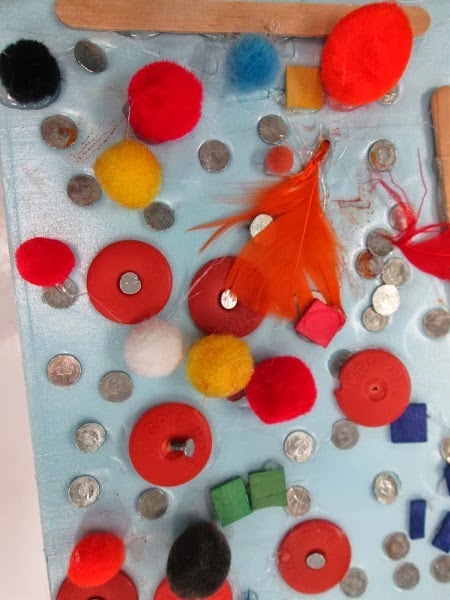 The challenge was for their creations to stay floating within the space that was marked. 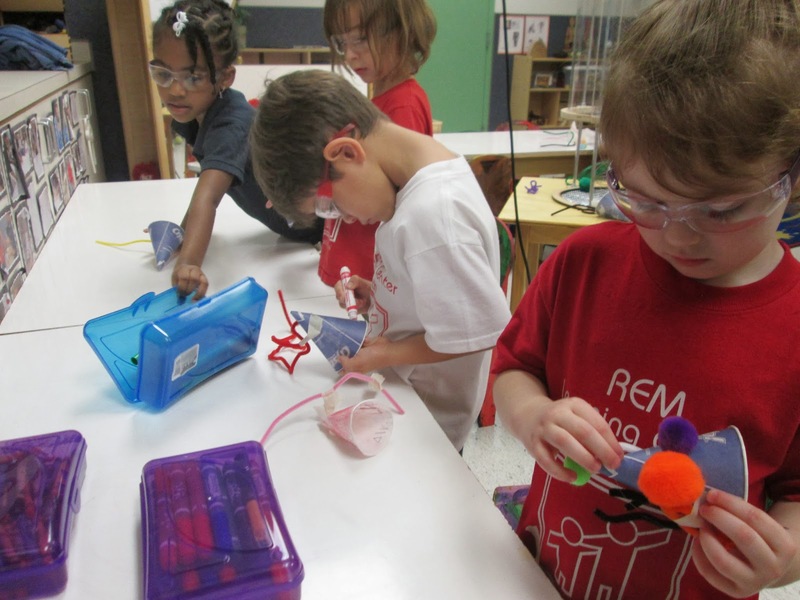 The children had miscellaneous craft items available, hot glue gun and cups. 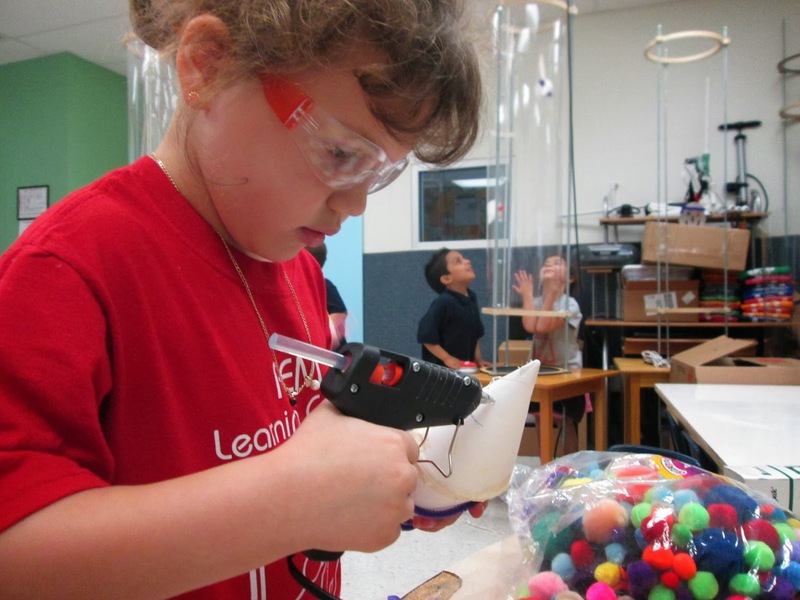 They began by randomly adding craft items to their cups with tape or hot glue. 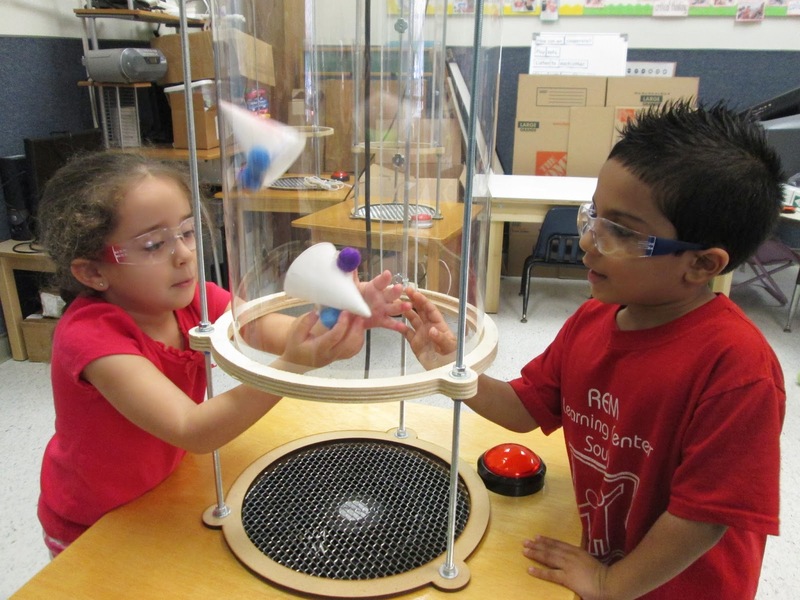 As each child finished decorating their cup they would approach a wind tube to observe their creation in the tube. If the decorated cup would not float or fly too quickly through the tube they would return to the table and remove or add crafts. 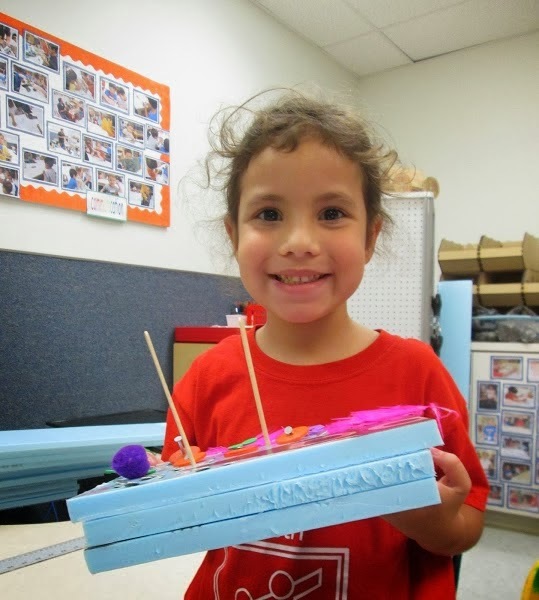 Through encouragement, praise and recognition of their effort, the children continued redesigning their cups until it floated within the determined goal. The second day was a continuation to the previous activity with a twist. 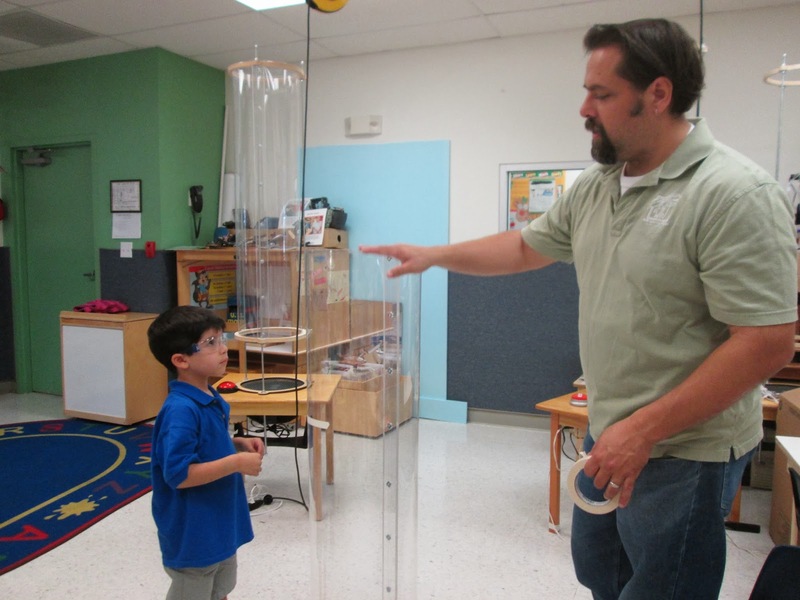 Before designing their floating structure the students decided where to place the tapes on the clear plastic tube. There were three wind tubes and each had to have the masking tape within the same distance from the base of the wind tube. The students were scaffold to find the correct tool within the classroom that would assist them in determining the measurements. Some suggestions were to use a yard stick, ruler or measuring tape. 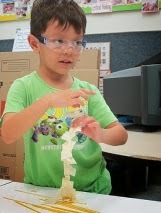 Each student was given the opportunity to measure or assist in placing the masking tape. 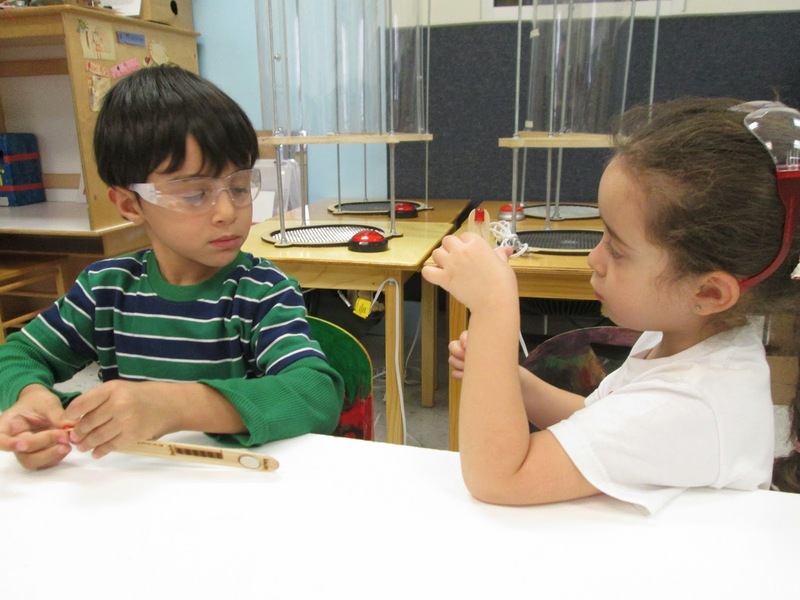 Once all three wind tubes were marked, the children were ready to create, observe, explore and redesign if needed. 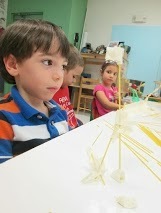 Having previously introduced building with straws,, the children were now ready to create a structure using spaghetti. The Spaghetti Challenge was changed a bit from the original rules to make the activity developmentally appropriate for the children. 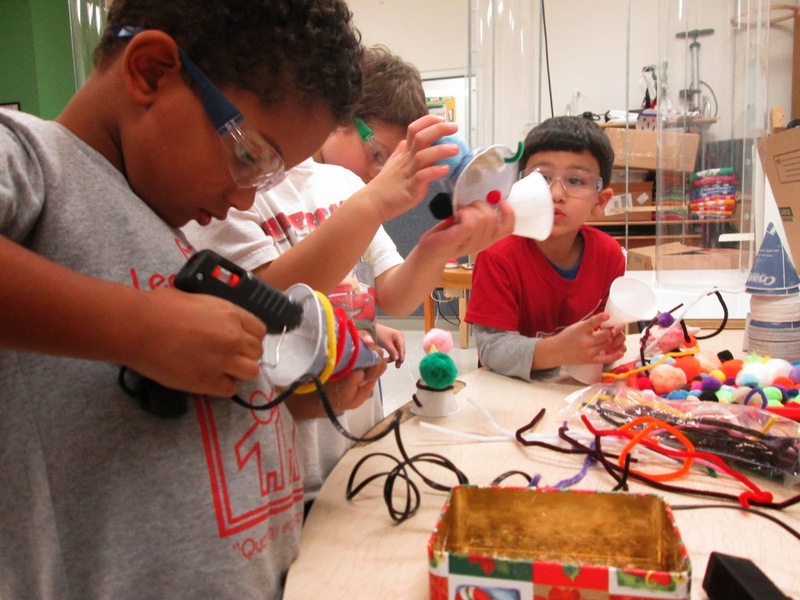 The materials available were spaghetti and masking tape. 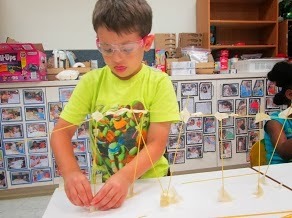 In an effort to not discourage the children from sustaining a spaghetti structure in an upright position they were allowed to use the masking tape to hold the spaghetti to the table. We began by discussing spaghetti and the changes which occur when it is cooked. The children were scaffold to determine which form of spaghetti was going to be more useful if they were to build with it. They also mentioned several ways in which the spaghetti could be secured as with hot glue, duct tape, paper clips, masking tape or yarn. 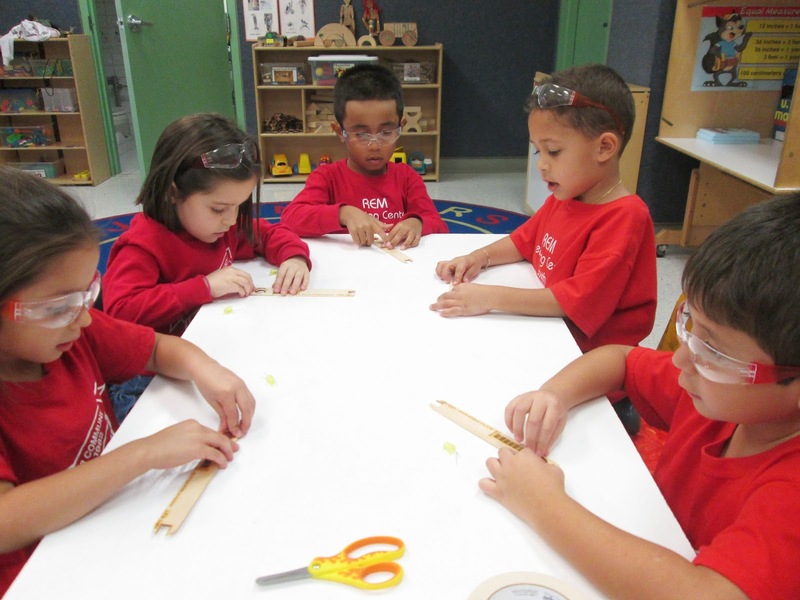 Each child was given 20 spaghetti pieces, masking tape and the length of the class to explore building. The children began working independently,but as time passed a few decided to work together. In each group there was a child that broke all of their spaghetti into tiny pieces, and one that clumped all 20 pieces together. Patience was needed as their creations became more elaborate and they had to problem solve why it was falling over or how the structure stayed upright as long as they held it with one hand. 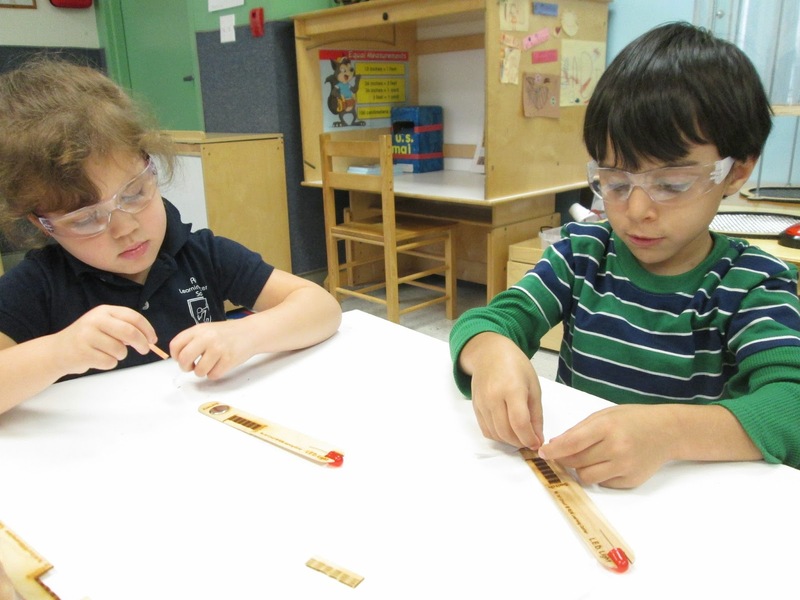 The children also grasped the precise pressure when using a piece of tape to connect the spaghetti so that it would not break. 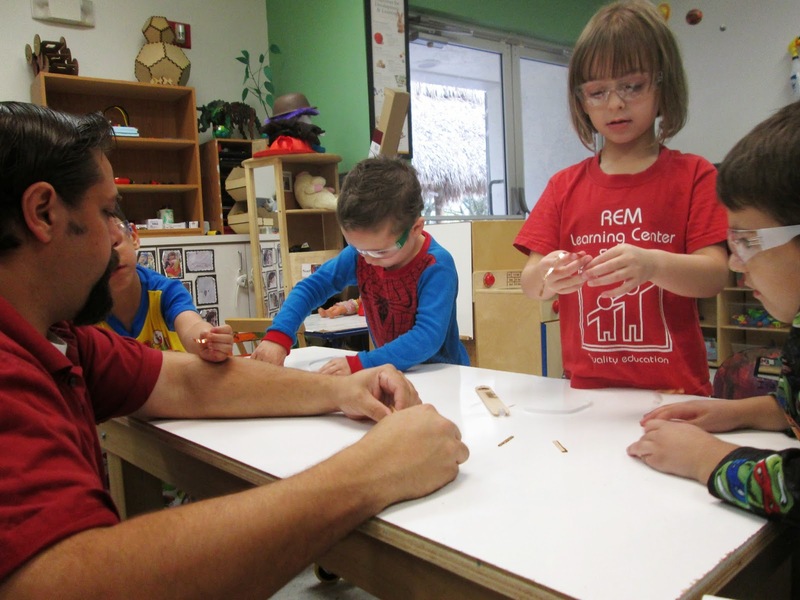 As an activity to introduce/practice hammers and nails we decided to use a material that was a little easier for the young ones than wood. We decide on rigid foam insulation. We started off by introducing the hammer and nails to the children. 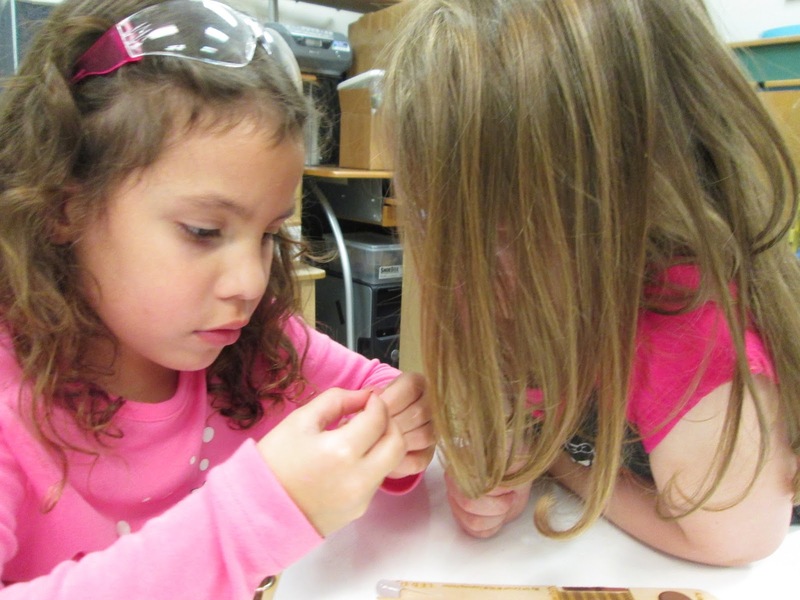 We discussed that nails (like glue, screws and tape) are used to bind things together. 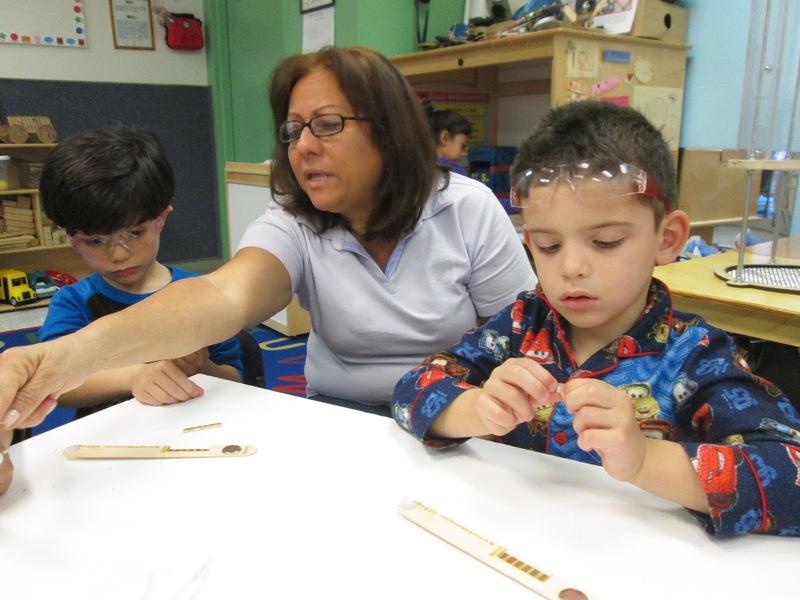 We showed them how to hold the hammer with one hand and the nail with the other to get it started, them nail in their first nail. From there they were free to practice, and boy did they. After a long period of free nailing we encouraged them to draw on the foam with markers and go back over the lines with the nails. 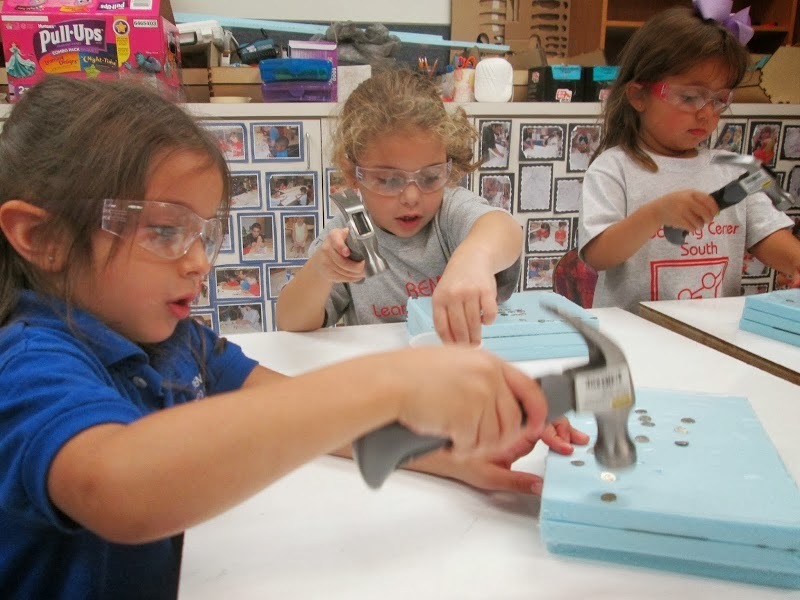 During the next session every child was eager to get hammering. 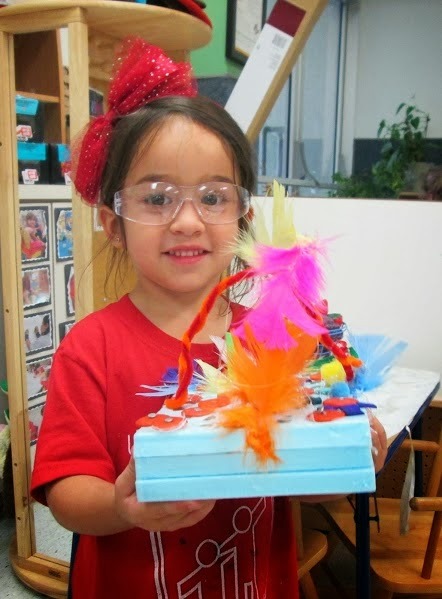 We brought out the crafting materials and hot glue gun so that they could add to their works of art. 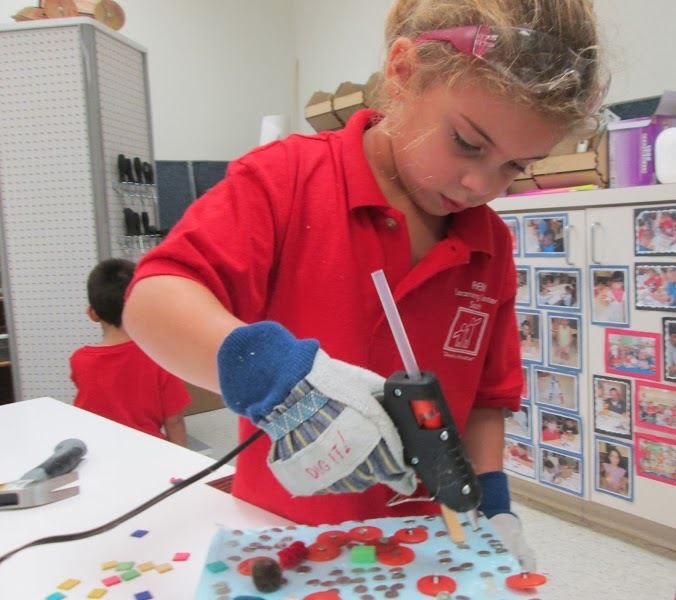 Every child learned to use a hammer and nail while creating inspiring works of free art. Playing with cubelets is always a fun learning experience. 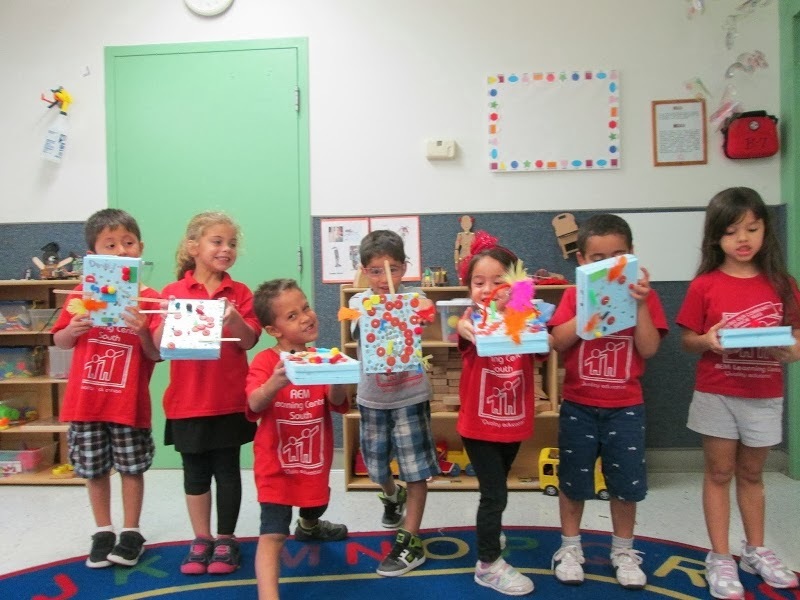 For this group of children it was their first interaction with the cubelets and we decided to try a new strategy for introducing them. 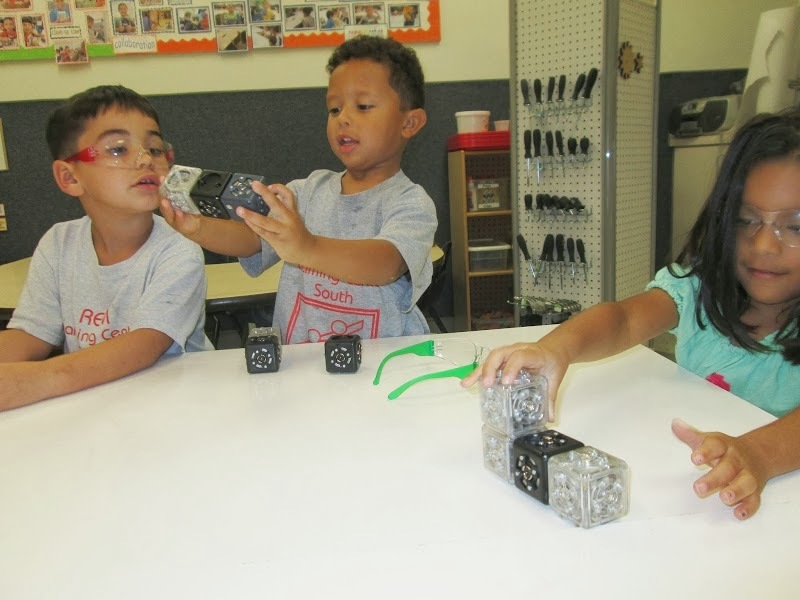 We simply gave them the blocks and tried to see if they would make some discoveries on their own. To keep it simple we limited the think blocks to only the battery block but gave them the full range of action and sense blocks to explore. 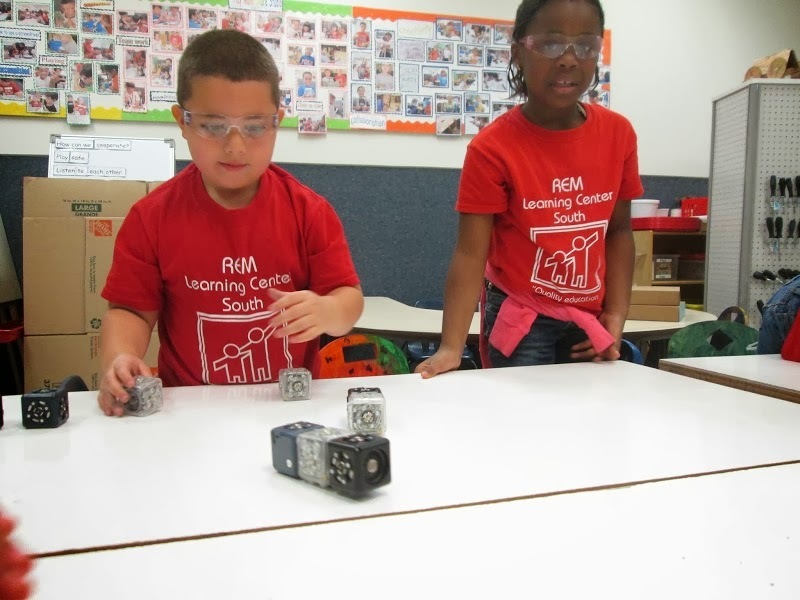 Once they got over the cool way that the blocks connect using magnets, which took up much of the time, they eventually stumbled upon a beep, or a block lighting up, or some even noticed the humming sound coming from the motor blocks before they noticed anything turning. We then used these discoveries to discuss the function of each block. We explored what we would have to do to each sense block in order to trigger the action block. 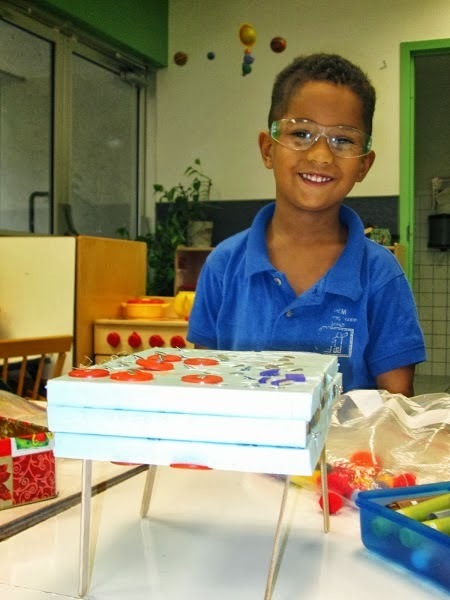 The children were then free to tinker with and combine the blocks to make their own creations. Not bad to be introduced to robotics at the age of 4yrs old and be able to create your own, thanks to the low barrier to entry of the blocks. 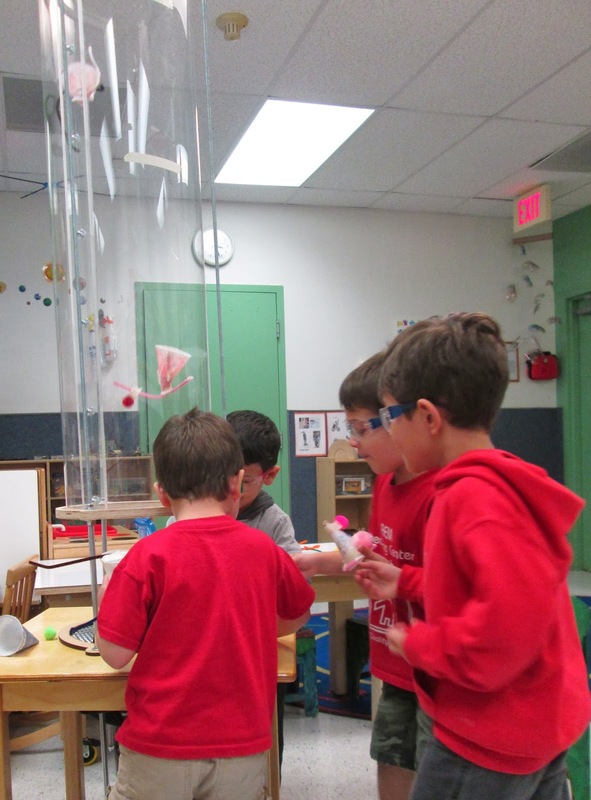 Inspired by an instructable we had seen recently, and eager to see how fun paper whirligigs would be in our wind tubes, we decided to play with the concept of propellers and rotors. We started off with rectangular strips of paper and we had the children play with and explore how the paper's orientation, and shape effected the amount of air resistance it experienced as it fell to the ground. When held with the long end horizontal the paper would flip, fall slowly, and move randomly on it's way down. When held with the long end vertically the paper would fall quickly, not flip, and typically landed in the same place. Next we showed them paper whirligigs and showed them how this design combines both the horizontal (rotors) and vertical (stem) paper orientation. We had them cut out their own using the scissors. After playing with them in the room we brought them over to the windtubes so that they could play with their creations and make modifications when needed. During the next session we introduced the plastic propellers, had them explore it's shape and discussed the similarities and differences of it's design to the paper whirligigs. Each of them spent time making a small rubberband powered helicopter similar to this instructable, and played with its design by changing the shape of the paper attached to it, the amount of times the rubberband was wound up, and the sequence used to launch them. We had a great time.